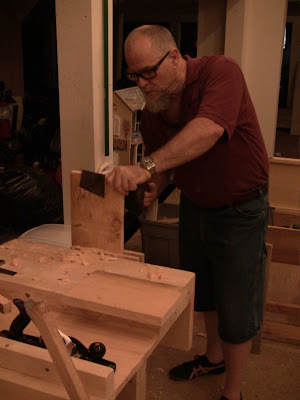 Last night I taught a class on rough stock preparation at the Close Grain School of Woodworking. The student was Brian Simmons, a former coworker who has a beautiful small farm in nearby southern New Hampshire. The class is about how to make small wood out of big wood, breaking down boards into rough dimensions with handsaws and planes. Brian has some experience as a carpenter, and had been planning on putting together a home power tool shop. However, he told me he has property where he wants to build a shop off the grid, so he decided to give hand tools a try. Having crosscut a board into short lengths, Brian rips a section down in the vise. I went over the tools and workspace options, then had him make a variety of cuts in a 4'-long board of rough milled pine. First I had him rip a 1" strip from the full-length board; I always start with this, because people think a long accurate rip is impossibly hard. In the process I had him deliberately go off course so he could see how to correct it. Since this leaves a rough and bumpy cut, the next thing I had him do was restore a straight reference edge with handplanes. One of my main points here is to work to the tolerance you're currently comfortable with. If you need a 1/2" safety margin from your line to allow room for mistakes, take it. As you get better, you'll be able to get closer. At this stage of a project, speed is more important than accuracy. Rough, ugly cuts can be cleaned up quickly. The other points are to use the tools that takes the biggest bite first (meaning your biggest, fastest saws), and to reduce the stock with easier cuts first before doing the more difficult cuts, as the cutting plan allows, so that you minimize the size of the pieces to be cut. Generally, that means crosscuts first, followed by rip cuts, followed by resaw cuts. Crosscuts are easier than rips because they're typically shorter. Resawing is by far the most laborious, so you want the pieces to be as small as possible. With handplanes, cleaning up long-grain edges is easy, cleaning up end grain is harder. I had him cut the board into progressively smaller pieces until they would no longer fit on the saw bench. Remaining cuts are done in the vise or on the bench hook. 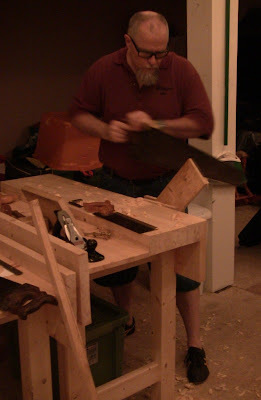 I also had him try the smaller panel saws, as well as hogging off excess width with a scrub plane. The last exercise was resawing. I demonstrated with a scrap, then had him resaw one of his pieces into two equal thicknesses. Brian resawing a piece into two thinner panels. He was surprised at how easily the saws cut. Most people don't realize what a sharp, well-tuned saw can do. Of course, working in pine is easy, but people always assume that handsawing is horribly laborious. Sure, some cuts will work up a sweat, but in actuality, it's quite fun and satisfying. After he had gone through the various cuts a couple times, we still had some time left, so I went over the basics of sharpening and setting saw teeth. A freshly sharpened and waxed saw is a high-performance instrument. The next class in the series will be final stock preparation, using handplanes and finer saws to dimension the rough cut parts precisely (meaning to 1/64" tolerances). If you're interested in taking a class, you can sign up for one of the pre-scheduled group classes, or schedule a private class.